Flat blade gives a crisp, target-style sight picture that eliminates the distracting Òdouble-notchÓ found on factory sights. .160" high blade (same as factory) features an angled and serrated rear face that reduces glare. Extends over the rear of the sight body for a cleaner look and gives a slight increase in sight radius. Available in two notch widths, .110" for target and PPC use, plus .125" for IPSC, IDPA and pin shooting. Deeper notch gives easier eye alignment. SPECS: 6061-T6 aluminum, matte black, anodized. Heat treated. .700" (17.8mm) blade width, .371" (9.4mm) height, .350" (8.9mm) long. .085" (2.2mm) deep notch. Kit includes windage screw assembly for installation. Fits Smith & Wesson K, L, and N frame revolvers. Will work on all with adjustable sights. Flatt blad gir en skarp, funnet mål-stil skue bilde som fjerner det distraherende Òdouble-notchÓ på fabrikken severdigheter. . 160" høy blade (samme som fabrikken) har et vinklet og taggete bakre ansikt som reduserer gjenskinn. Strekker seg over baksiden av synet kroppen for et renere utseende og gir en svak økning i skue radius. Tilgjengelig i to hakk bredder,. 110" for målet og PPC, pluss. 125" for IPSC, IDPA og pin skyting. Dypere hakk gir enklere øye justering. Spesifikasjoner: 6061-T6 aluminium, Matt svart, eloksert. Varmebehandlet. . 700"(28.7 mm) PLOGBREDDE,. 371" (9.4 mm) høyde,. 350"(8,9 mm) lang. . 085"(2,2 mm) dype hakk. Kit inneholder windage skruen forsamlingen for installasjon. Passer Smith & Wesson K, L og N ramme revolvere. Fungerer på alle med justerbare. This is being used on a S&W 625JM for competitive shooting. Searching the web, some people complained that the new blade had "play" and would wiggle around. Not the case for me, it's in there rock solid. In full disclosure I had a revolver gunsmith install it for minimal cost, so I can't say how difficult it was to put on. It's worth it though, the sight picture is incredible for a fraction of the cost compared to other options. The notch is a perfect .125" and appears to be slightly deeper, which is good. It also comes with the replacement parts for installation which is something other brands don't do, about a $10-15 value. It's a very functional piece that I expect will help my scores, especially on the long shots. It really should come with this from the factory. If used on a self-defense revolver there is a chance it could snag on clothing, as the edges are sharp, but for a competition gun that's a good thing. Excellent product for smith & wesson k-frame 14 model target masterpiece. I didn't read the description completely and ordered a new windage screw. This kit comes with the screw/nut/detent/and spring to replace the hardware you have to break to put the new blade in. Sight is easy enough to install if you follow the directions. It includes EVERYTHING you need, and some spares in case you lose bits. Nice touch. Once installed, it's tighter in windage vs the stock sight. But there's a slight amount of rotational (fore aft) play, which because of the rear offset, results in slight up/down play. Most likely it won't make a noticeable effect during target shooting, but we will test it pushing it both ways and see if it changes point of impact. Sight picture Is VASTLY superior to stock. I found the .110 aperture perfect on an S&W 625 with 5" barrel. 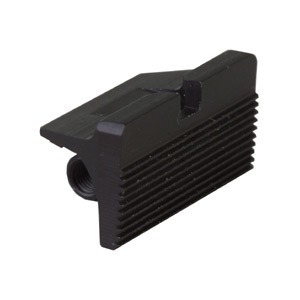 For defensive use, the stock sight is stronger simply because it doesn't have a large piece hanging off the back. I suspect a strong hit will bend or break this aluminum unit. But for paper punching, even hunting, you can't beat the sight picture. It's really outstanding. .125" Notch Sight Blade Kit Flatt blad gir en skarp, funnet mål-stil skue bilde som fjerner det distraherende Òdouble-notchÓ på fabrikken severdigheter. . 160" høy blade (samme som fabrikken) har et vinklet og taggete bakre ansikt som reduserer gjenskinn. Strekker seg over baksiden av synet kroppen for et renere utseende og gir en svak økning i skue radius. Tilgjengelig i to hakk bredder,. 110" for målet og PPC, pluss. 125" for IPSC, IDPA og pin skyting. Dypere hakk gir enklere øye justering. .110" Notch Sight Blade Kit Flatt blad gir en skarp, funnet mål-stil skue bilde som fjerner det distraherende Òdouble-notchÓ på fabrikken severdigheter. . 160" høy blade (samme som fabrikken) har et vinklet og taggete bakre ansikt som reduserer gjenskinn. Strekker seg over baksiden av synet kroppen for et renere utseende og gir en svak økning i skue radius. Tilgjengelig i to hakk bredder,. 110" for målet og PPC, pluss. 125" for IPSC, IDPA og pin skyting. Dypere hakk gir enklere øye justering.